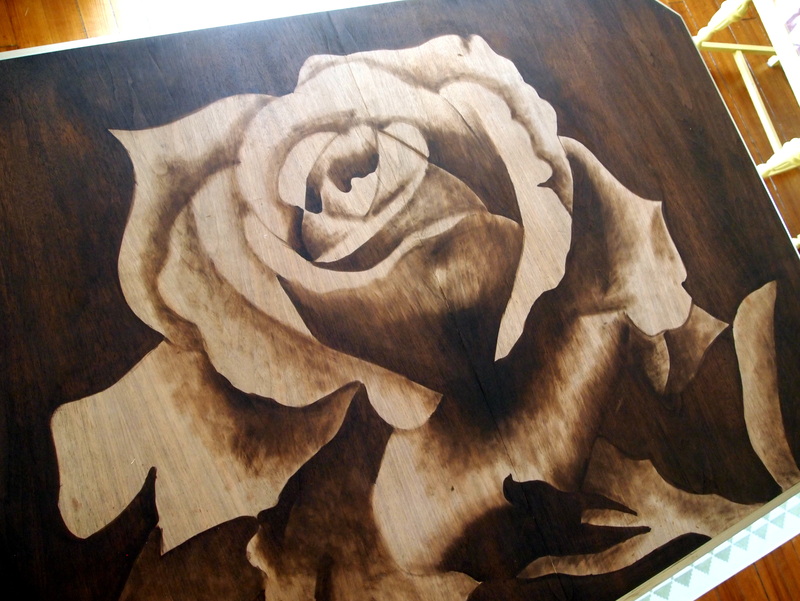 Doing wood stain art is soooo addicting for me. I wouldn’t call it ‘instant’ gratification, but the transformation happens over the course of a couple hours… and it’s so fun to watch it unfold! 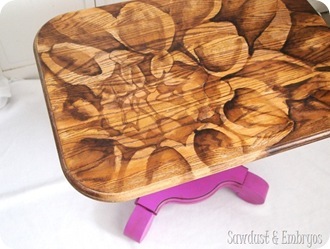 If you missed my last Stained Art Table time-lapse video, click here! Shortly after posting that video, I was already having the itch to stain again, and Nick and I fell upon this dining table at a yard sale for $10 buckaroos! I actually stripped it the same day we bought it because I’m paranoid about things like lead-based paint and small children (of which I have 3). After stripping and sanding the bleep out of it, I started looking for a design to stain onto the top surface. I don’t have an affinity for flowers or anything, but they work so well for this technique because of the soft curves, shadowing, and contrast. Then, using my overhead projector (we use one similar to this, but you can often borrow these from your local library), I projected the image onto my table top and traced the lines with a pencil. A company called Unicorn Spit sent me some of their vibrantly colored water-based stains. I loved the idea of accenting a bit with a bright color, but I also wanted the bulk of the artwork to still look like rich wood. So I decided to try using RustOleum’s gel stain which is water-based… and IT SUCKED. Do not use gel stain for this technique! Ever! EVER!!!! This time I went with my tried and true oil based RustOleum in Dark Walnut. I wasn’t sure that I could stain with a combo of oil and water based stains, but I decided I would rather leave out the bright colors than have to use ONLY bright colors. And now that I knew stripping stain is doable, there wasn’t any risk. In the video, the brown stain is RustOleum Dark Walnut, the black, white, and aqua are Unicorn Spit. I have to admit I was a little skeptical about these bright stains with them being water-based and all. But they are awesome. The colors are so rich, and you can make them as bright or as muted as you want with my shading technique. It’s called a gel stain, but it’s very watery and easy to spread and shade with, so I’m not sure why they call it a gel stain… but I don’t care either! Can’t wait to play with these colors some more! 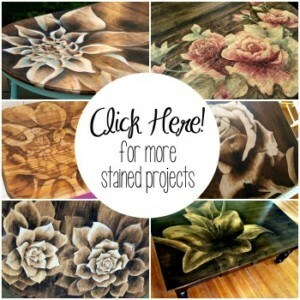 Be sure to check out my other stained projects by clicking on each image below. And Click here for a simplified tutorial of a more basic flower image that anyone can do! I know some of these more intricate designs look very difficult, but it’s definitely something you get better at the more you do. I know that others can do this too, because dozens of people have sent me pics of their work after being inspired by my idea. Amazing right? You should soooo give it a try. 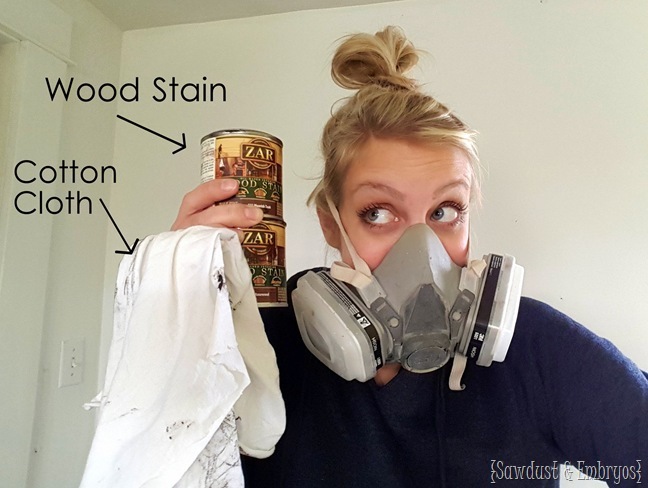 There’s nothing to lose if you just grab a scrap piece of wood, a can of stain, and a cotton cloth (or cut up t-shirt!). And if you DO, you know the drill… SEND ME PICS! I can’t wait to see your version! Cant wait to try this , I will be running to the store to get some wood to practice on along with some stain . I have some furniture i want to redo and knew i wanted something different . found this on Pintrest . 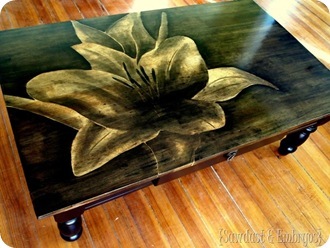 I have a coffee table that has been in my family for over 50 yrs and this will be perfect for it . Lavishing products!!! Craftsmen have shown their brilliant skills and traditional art by creating these marvelous wooden dining set. Here is a cool pic of a before and after dining room table with epoxy. 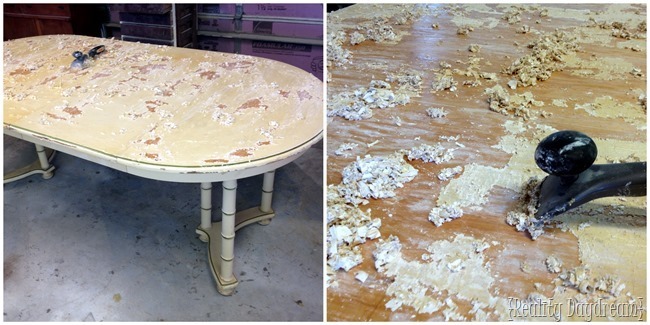 http://www.bestbartopepoxy.com/content/table_top_epoxy.jpg That is not the epoxy that I am referring to. I don’t know anything about that company. Stone coat countertops has a Youtube channel that shows how durable their finishes are. Thank you for sharing this. I am going to give it a try. I never thought to do this before. I have just the piece to get started on! 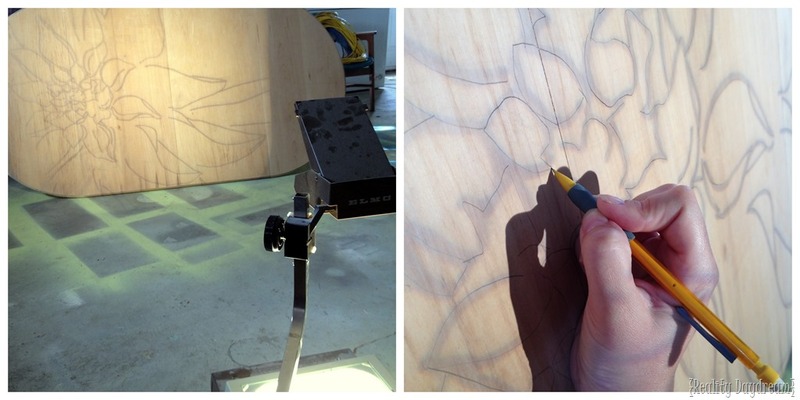 Yes we LOVE using epoxy! 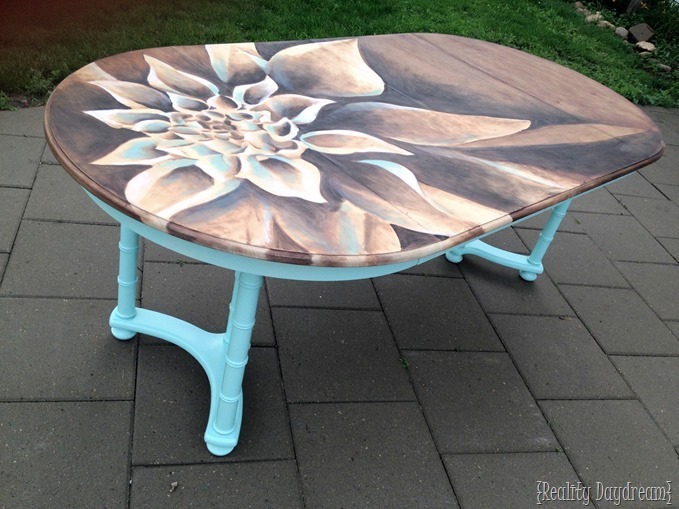 It really brings these stained designs to life! I would love to buy one of your tables or have a table I already have done. Where can I buy one? Your work is so unbelievably beautiful. 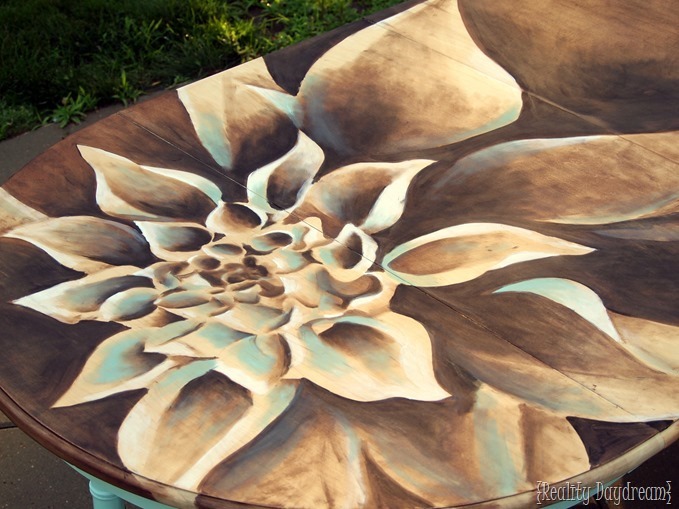 You make an ordinary table into a fantastic piece of art to be cherished and passed on. Please let me know. Thank you so much for sharing your gift! Beth, when I first saw this technique of yours, I promised myself I would try it. Well I finally did. It is a small cabinet and it turned out beautiful. I will send a picture to you via email. I also have just started my own blog, harder than I thought it would be. 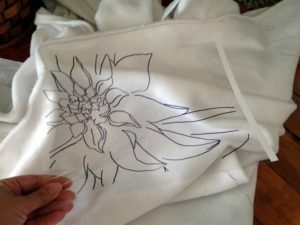 I hope you don’t mind me mentioning you on my blog since the piece I did is on my blog. I don’t have much in my blog yet but I am getting there. Thanks again for the beautiful tutorials and ideas. I know 🙁 It’s super frustrating that it won’t let you share images in the comment section. I still want to seeeee though! 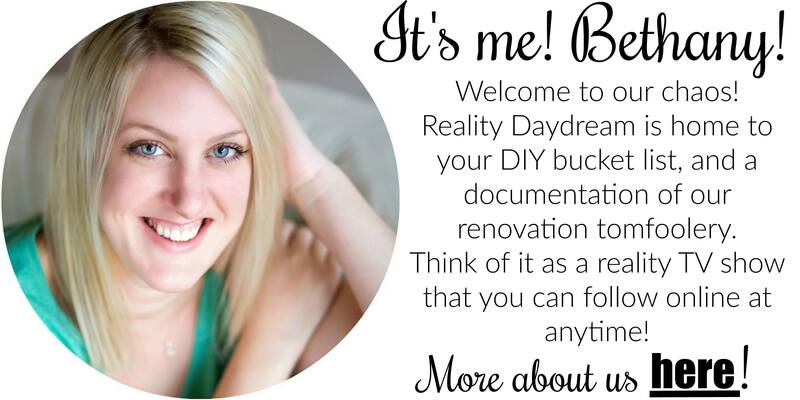 Email me at beth@realitydaydream.com!! I waited 20 min for the page to load, the ads are forever. Not going to risk starting the video. Not worth it, and I have high speed internet. 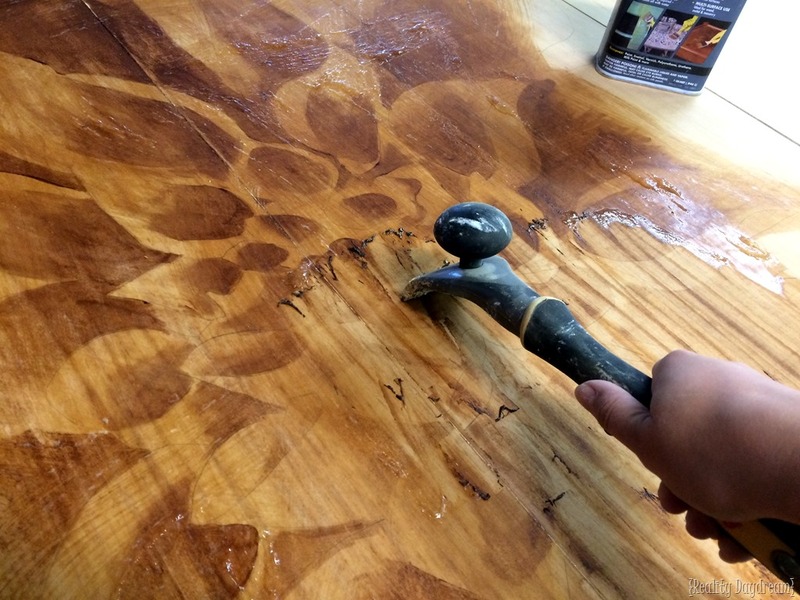 I do a lot of staining but normally don’t do a lot with different shades on the same piece…when I do I don’t get sharp lines – how do you do sharp lines without it bleeding through the grain? Going to try this on a huge lazy susan. Ooo fun! You’ll have to send pics when you’re done! These are so beautiful, but I can’t draw a stick person, so way out of my league. I’ll just enjoy your photos! I just did this technique on a garage sale table. Very fun and easy to do! 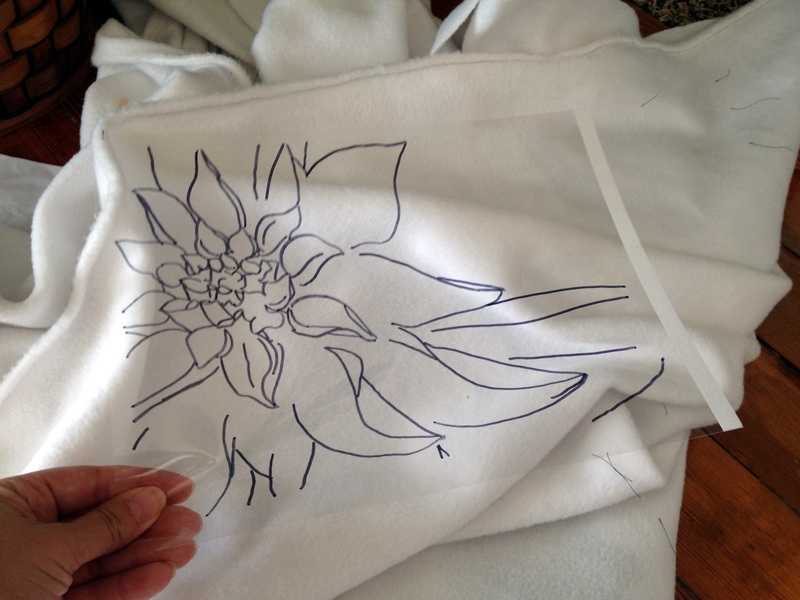 Its amazing….I am starting on a SMALL table…IF it turns out, I will post!! 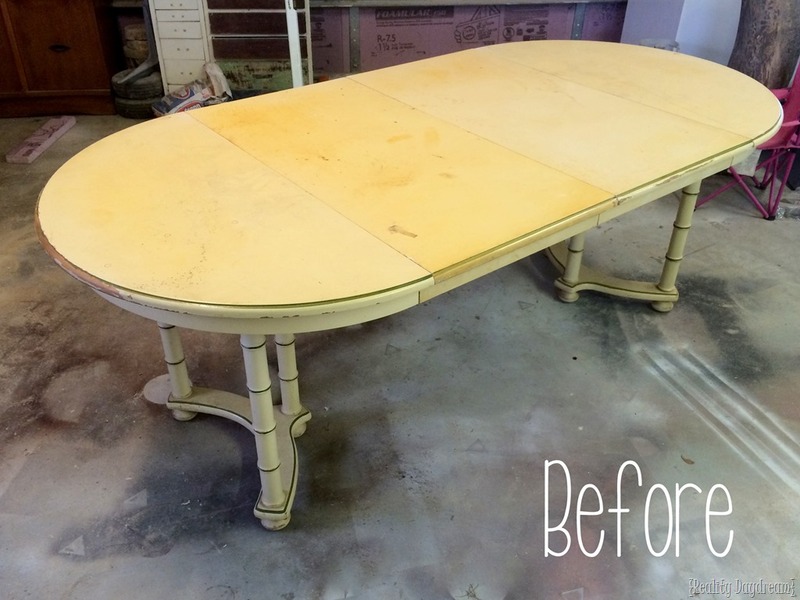 Have you ever refinished furnigure that had a veneer? I very rarely comment on postings, but this one I could not let go. Your work is absolutely stunning and love the rose design. 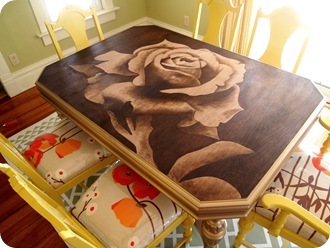 I have been looking for a new dining room table and this would be beyond perfect. Can you share more information on prices? Fantastic! I love seeing people be creative! I love the work you do and it inspires me. How long did it take beginning to end for the table you show in the video? Thank you for sharing. I love it, I think it is the perfect choice of color. hi, i just saw this video on FB and i was wondering…. can i send you a table and you could do this for me if i paid you? any floral design you’d like!? or i could take it to you.. lol really, i’m serious! you’re crazy good!!! the blue on the flower is it a oil based stain also? The blue, black, and white are water based stains from Unicorn Spit. Have you ever done one with a tree? I would LOVE to see one? I’ve played around with the silhouette of a tree on scrap wood, but I haven’t done it on a large scale yet. Soon! And I really want to do a beachy landscape with a sunset too! Some many ideas!!! Do you have any pictures for little girl or boys room furniture? You are amazing you inspired me to try my hand at staining. My first try was all freehand I was very happy with it 🙂 I love to see your work. You are sooo talented! Absolute beautiful work. Have you thought of using mineral crystals (malachite, azurite, copper, etc.) as subject matter? How about trees or tree branches? What ever you do, keep creating! No but you’ve given me some great ideas! You are one talented young woman! I love this technique! As I watched, my mind went to so many projects we have done for people in refinishing various pieces and the possibilities. I am very interested to see your technique applied to our product: Stainable Primer. It can be used on any durable surface to create a stainable wood surface without stripping, heavy sanding, or other traditional prep. It will even turn wood, metal, laminate, mdf, melamine plastic, just about any surface into a stainable wood surface, imagine the mixed media possibilities! 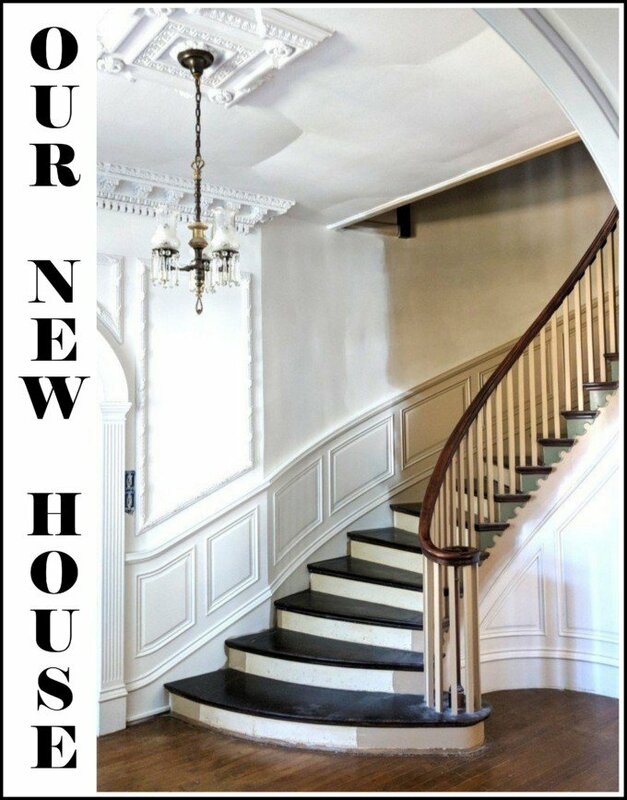 Give us a call we would love to work on a project with you! Dave @ Montana Living – Direct! This is sooo weird! I got to your blog from Vintage Revivals – As I was looking around I saw the table (which I was on craigslist last week (Cedar Rapids, IA) and saw that EXACT table), looked at your ‘about me’ and realized we must be neighbors! What a small world. Gorgeous. This is a table you would NEVER put a tablecloth on. this is just genius! 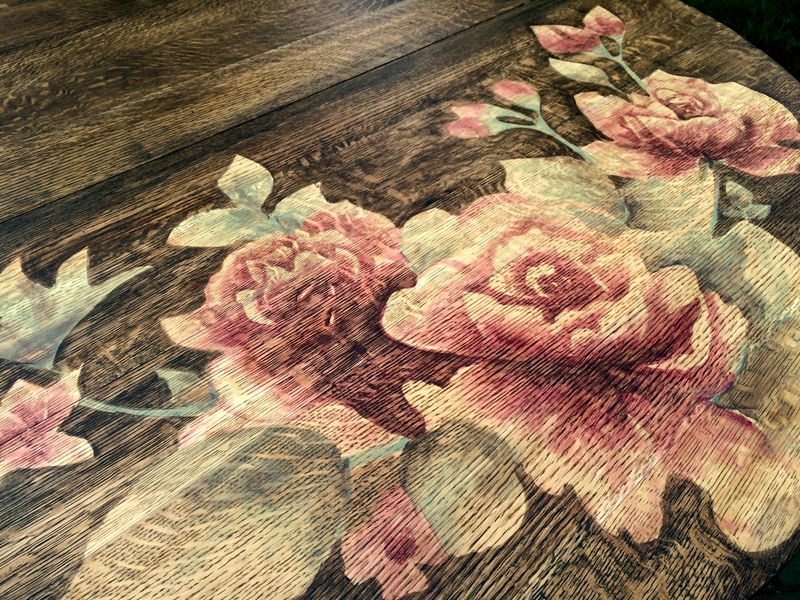 I am in love with your table. 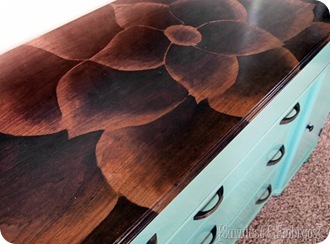 I love to restore furniture but have never seen this.. in <3..
this is really a beautiful project! 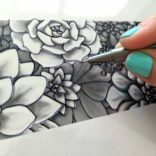 i loved the time lapse video and how you can kinda see the flower, but as the shading is added it just POPS out!! great job!!! So incredible to watch the video! It is really nice of you to share your technique, not that I ever could do something that amazing, but it is inspiring! 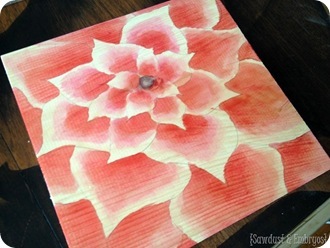 You should start with a simple symmetrical flower… and on a scrap piece of wood. 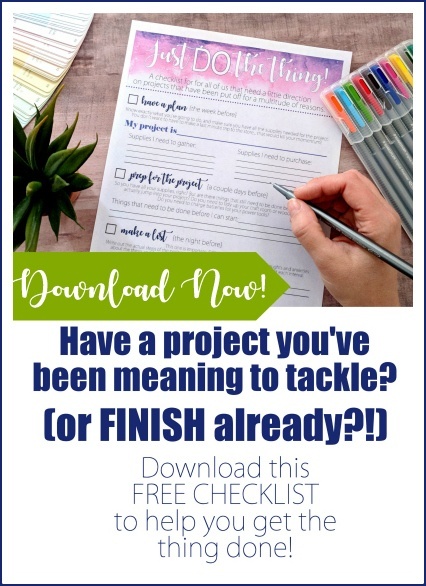 You might surprise yourself! You ROCK Beth! The only problem is, if I had that table I would never want to put anything on it. Hehe! I feel that way about the one in my dining room. I don’t even want to put a centerpiece or vase of flowers on it! Beautiful and you’re very talented!